Dylan King has won the final round of the Western Australian Rally Championship with a clean sweep of stage wins at the weekend. “After each run through the big water splash, water got into the intake, causing the car to misfire and we dropped time,” King said of the issues. “There wasn’t much we could do – we had to struggle with lack of power, before sorting it out – we changed the air filter to a dry one after the first run but completed the second and third with a wet air filter.” he added. It wasn’t all about King’s dominant performance as ARC regular, John O’Dowd, sealed the victory in the overall championship. “The rally was great besides hitting a rock on stage five,” the Subaru driver said. 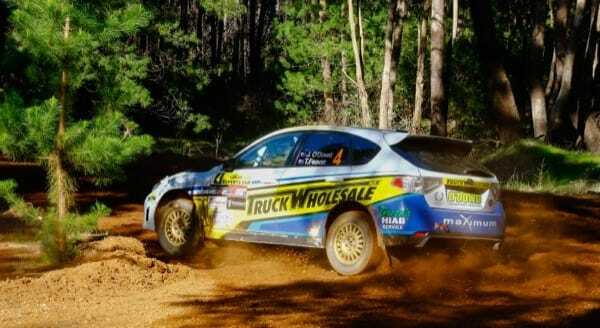 It is O’Dowd’s first Western Australian Rally Championship. O’Dowd is looking at competing at Rally Australia in November, and is looking to run in both the WARC and Australian Rally Championship next year. The final round of the championship is the Darling 200 to be held on the 10th of November where only 2WD and Clubman Cup championships will run.